Tonight’s FOX News Special focuses on Obama’s several ties to anti-American radicals and the Far Left group ACORN- a group that has ties to both Obama and Ayers. You can order your copy of this explosive Obama biography at Amazon.com. 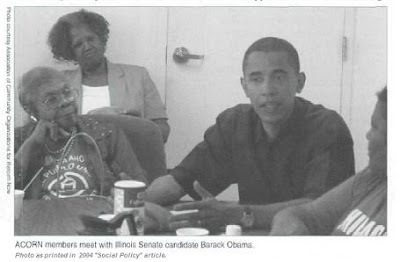 Here is a photo of Obama guiding ACORN activists in 2004. One of Barack Obama’s first big “community organizer” jobs involved ACORN in 1992. Obama also trained ACORN employees (but says he wasn’t paid by ACORN?). He represented ACORN in court. Obama worked with and protested with ACORN. His campaign donated $800,000 to ACORN this year for voter registration efforts. And, ACORN even canvassed for Barack Obama this year. But, they sure have been looking for dirt on Cindy McCain.